Enjoy a little citrus zing in a minty classic mojito. 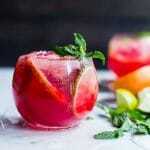 Blood Orange Mojitos brighten up this classic cocktail during the coldest days of the year. Refreshing. Simple. Make in a cocktail (low ball) or the classic Collins or high ball glass! A. For a Low Ball Glass: in a cocktail shaker, or cocktail mixing glass, layer the cut lime wedges, and mint leaves. Pour in the simple syrup and use a muddler to muddle the mixture for about 30 seconds. The goal is to squeeze out the lime juice and to allow the mint to release its oils. Add the rum, strain in blood orange juice and top with ice. Stir. Strain into an ice filled double low ball cocktail glass. Top with club soda, stir, taste for simple syrup adjustment then garnish. B. For a Hall Ball or Collins Glass: muddle the lime wedges and mint leaves. Pour in the simple syrup and use a muddler to muddle the mixture for about 30 seconds. The goal is to squeeze out the lime juice and to allow the mint to release its oils. Add crushed ice, and light rum to the mixture. Using a fine mesh strainer, strain in the fresh squeezed orange juice. Stir. Top with Club Soda. Stir. Taste for simple syrup adjustment then garnish. Orange juice may be squeezed up to one day in advance and refrigerated. *For an OVER THE TOP minty-orange Simple Syrup: Pour 1/2 C (120g) cane sugar and 1/2 C (116g) water into small saucepan and bring to a boil. Stir. Boil until all the sugar is dissolved, just a few minutes. Add a few sprigs of mint and 1 tsp of orange zest to the simple syrup. Lid. Allow it to steep for about 10 minutes before straining the syrup to a storage container. Refrigerate and cool before use. Store for up to two weeks in the refrigerator.